We recommend checking out our discussion threads on the Da-Lite 73577 Cosmopolitan Electrol Motorized Projection 73577, which address similar problems with connecting and setting up Electric Screens (Square & 4:3 Formats) Da-Lite. The user manual for the Da-Lite 73577 Cosmopolitan Electrol Motorized Projection 73577 provides necessary instructions for the proper use of the product A/V Presentation - Projection Screens - Electric Screens (Square & 4:3 Formats). The Dalite 50 x 50" Cosmopolitan Electrol Motorized Projection Screen will be a great choice for educational or corporate use - especially when you are not able to install the screen directly into the ceiling. The tensioning feature assures that both the horizontal and vertical planes are held firmly in place providing a flat, even projection surface. The motor has an automatic thermal cutoff system which prevents burnouts. In addition, it features a braking system that prevents "creeping" by supplying adjustable limit switches to automatically stop picture surface in the "up" and "down" positions. 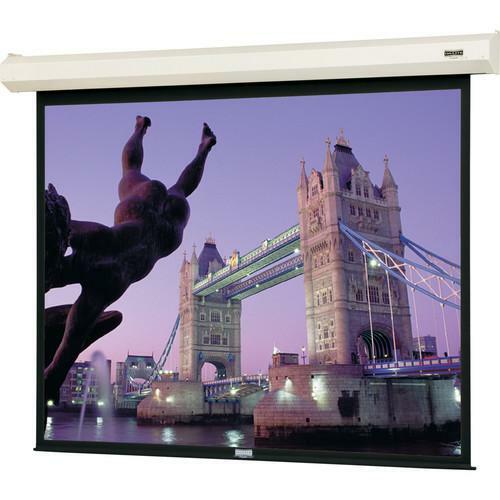 This heavy-duty screen has a metal casing (steel) with matching end caps giving it a finished, professional look. The in-the-roller motor is designed to be as quiet as possible and is oiled for life. An optional floating mounting bracket allows the screen to be mounted onto a wall or ceiling studs and aligned left or right. Box Dimensions (LxWxH) 69.5 x 8.25 x 6.0"
The user manual for the Da-Lite 73577 Cosmopolitan Electrol Motorized Projection 73577 can be downloaded in .pdf format if it did not come with your new electric screens (square & 4:3 formats), although the seller is required to supply one. It is also quite common that customers throw out the user manual with the box, or put the CD away somewhere and then can’t find it. That’s why we and other Da-Lite users keep a unique electronic library for Da-Lite electric screens (square & 4:3 formats)s, where you can use our link to download the user manual for the Da-Lite 73577 Cosmopolitan Electrol Motorized Projection 73577. The user manual lists all of the functions of the Da-Lite 73577 Cosmopolitan Electrol Motorized Projection 73577, all the basic and advanced features and tells you how to use the electric screens (square & 4:3 formats). The manual also provides troubleshooting for common problems. Even greater detail is provided by the service manual, which is not typically shipped with the product, but which can often be downloaded from Da-Lite service. If you want to help expand our database, you can upload a link to this website to download a user manual or service manual, ideally in .pdf format. These pages are created by you – users of the Da-Lite 73577 Cosmopolitan Electrol Motorized Projection 73577. User manuals are also available on the Da-Lite website under A/V Presentation - Projection Screens - Electric Screens (Square & 4:3 Formats).